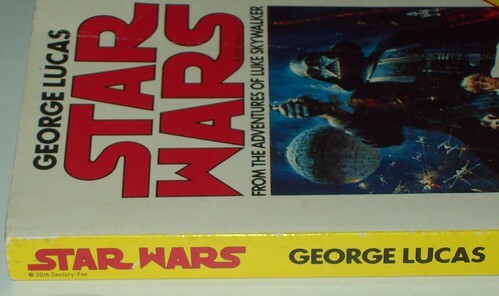 A long time ago … there was a Pointy W.
I’m a sucker for the classic saga logos in unusual incarnations, and I love the red-on-white look of this UK edition of the paperback. Of course, the bigger draw for me is its use of one of the later pre-release title logos, with its distinctive “pointy W.” (And if you want a neat trip back in time along these lines, you should check out this fact-and-picture-packed article by Star Wars collectibe guru/historian Pete Vilmur.) The pointy W is also on the spine logo and inside on page two. There are a couple other little details I like about this particular edition, too. The bright yellow back and spine, for instance, lettered in black and red, have a very comic-book or old pulp paperback type feel about them. 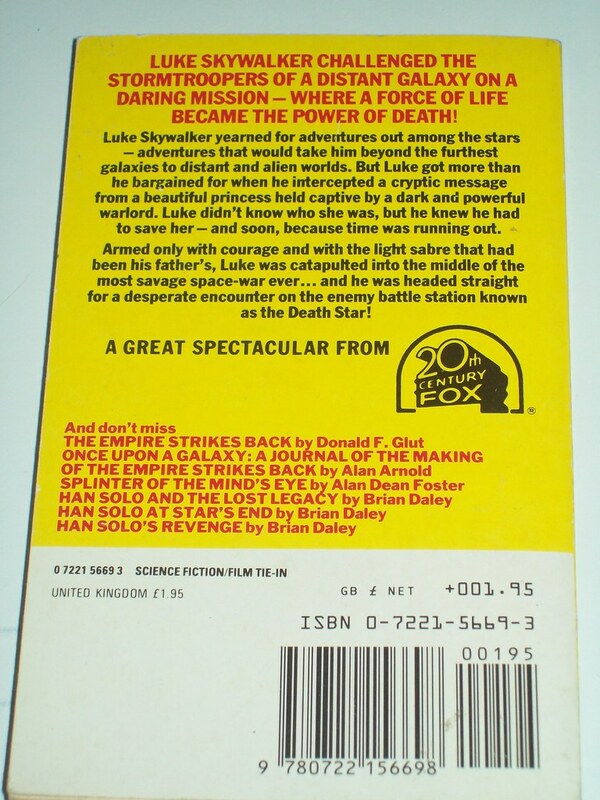 And the back cover blurb goes with the British spelling of “light sabre,” even though within the text of the novel itself, it’s spelled “er,” as it is in the American versions. The book also lacks the glossy-paged middle section of film stills that were in those editions. So this thing is not only after Empire, it’s post-Jedi. It’s post-Ewok Adventure. 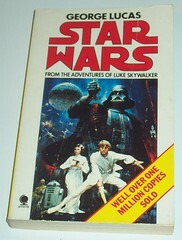 It’s basically post-everything-relevant-in-the-original-Star-Wars-era but somehow never got its logo updated. Twenty-some years later, that’s exactly what makes it so cool. My daughter and one of her friends are totally hooked on Jim Gaffigan‘s Comedy Central specials, and hearing them re-create quotes and bits about Hot Pockets and bears and bacon reminded me of when my friends and I used to do the same thing with Bill Cosby and Steven Wright. 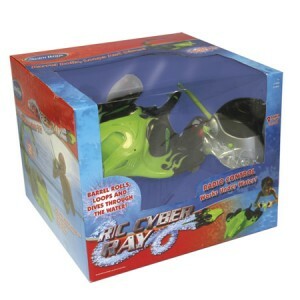 I wrote about it over at GeekDad – why not go read it?